The colour and vitality of Inuvik will take you by surprise. You’ll see paved streets lined with brightly coloured houses on pilings, dome-shaped buildings and the strange snake-like “utilidor” system. In the summer the town hums with activitity. Tourists walk the streets and air charter and construction companies take advantage of the continuous daylight. A planned community, Inuvik offers the comforts of urban living in an arctic setting. Visitors can experience several cultures here, and true frontier hospitality. Inuvik is situated on the East Channel of the Mackenzie Delta. At 133°43’ west longitude, it is 10 degrees farther west than Victoria, British Columbia. The community is within the taiga forest, just south of the tree line and west of the open tundra. The Arctic Ocean is only 97 kilometres north and the Arctic Circle is 200 kilometres to the south. With the summer’s 24-hour sunlight, there is plenty of time for visitors to experience the vast wilderness at Inuvik’s doorstep. Winter is the time for “noon moon” activities such as driving on ice roads, snowmobiling, dog sledding and curling. The Inuvik area is a snowmobiler’s heaven, with 10,000 kilometres of Mackenzie Delta Channels to explore, as well as tundra trails north to the Beaufort Sea coast and west into the Richardson Mountains. The aurora borealis (“northern lights”) can be seen during the dark months. Locals say that Inuvik is so far north that they have to look south to see the northern lights! Some residents earn their living hunting, trapping and fishing, but most are employed in government and aboriginal offices or in transportation, construction, petroleum exploration and tourism companies. Inuvik was conceived by the Canadian government in 1953. 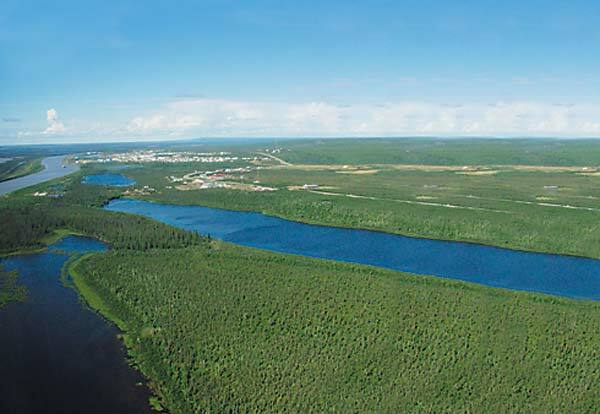 It was intended to replace the hamlet of Aklavik in the Mackenzie Delta, which was subject to flooding and offered limited space for expansion. Originally the community was designated “East Three” by the survey parties who spread over the Mackenzie Delta searching for town site locations. Of six sites on the west side and six on the east side, East Three was chosen for its large flat area, navigable waterway, tree cover and gravel supply. The years 1964 to 1970 were a period of adjustment as residents adapted to life in the new community. In April, 1967, Inuvik achieved village status, and in January 1970 it became a town with an elected mayor and council. And with completion of the Dempster Highway in 1979, Inuvik became part of the Canadian highway system. Petroleum exploration in the Mackenzie Valley and Beaufort Sea provided tremendous employment and business opportunities in the region beginning in 1971. These activities continued until 1990 when petroleum companies decided to pull out because of disappearing government subsidies, low gas and oil prices, and local resistance to resource development. Since 1999, oil and gas companies have once again begun to explore for natural gas. During the time that multi-national corporations were busy tapping petroleum resources in the Mackenzie Delta, aboriginal organizations were gaining the leverage they needed to settle their land claims with the Canadian government. The Inuvialuit claim was settled in 1984 and the Gwich’in claim in 1992. Inuvik is home to members and organizations of both groups.